Two on the Bounce for HAAKER ! With a super technical track – more so than those of Germany and Poland – we expected that the Akrapovic Super Pole would be closely contested. 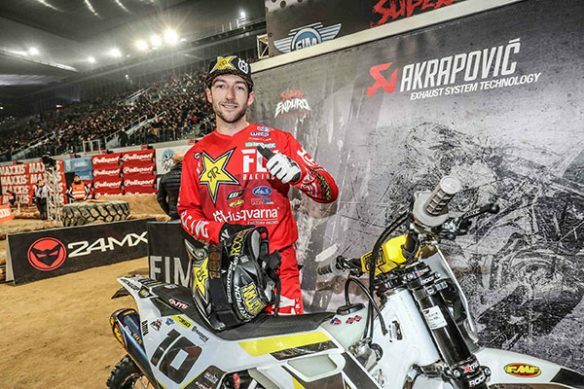 And although the ‘three favourites’ have been the strongest in Super Pole so far this season, in Madrid HAAKER (USA – Husqvarna) stormed through to take his second pole on the bounce…. The Californian now has a second Super Pole in a row, with a time of 00’38.073, at the expense of his compatriot Cody WEBB (USA – KTM), 00’38.378. Finally, Taddy BLAZUSIAK (PL – KTM) had to settle for 3rd place with a time of 00’38.571. In the provisional ranking of the Super Pole powered by Akrapovic, Colton HAAKER now has a one point lead ahead of WEBB, and five on BLAZUSIAK. So will HAAKER be able to take a third pole position on February 9 and take the only crown he’s been missing in his career. Do WEBB and BLAZUSIAK have the means to come back strong? The Akrapovic Super Pole at the Hungarian Grand Prix in the Papp Laszlo Sportarena in Budapest (Hungary) will be worth its weight in gold! Vorig berichtVorige New 24MX Leader in Prestige, as HOARE Flies in Junior !